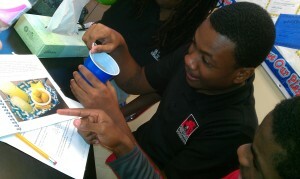 The ChemClub Cookbook at work! Students make lemonade to learn about reactions. A student shows her enthusiasm for the Sweet Lemonade recipe. Students at Cesar Chavez Public Charter High School for Public Policy in Washington, DC, had a wonderful time in Chemistry doing a lab on homogenous and heterogenous mixtures. 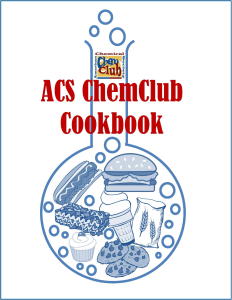 Ms. Burney and Mrs. Gibson, the two chemistry teachers at Chavez PCHS, were graciously given the “ChemClub Cookbook” from the American Chemical Society to help aid their new 11th grade scholars in making chemistry hit a little closer to home. They used the Sweet Lemonade recipe to see if lemonade does become sweeter, as more lemon juice is added. 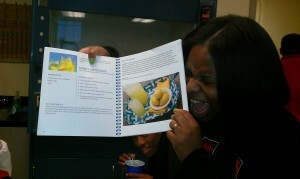 They really enjoyed using the cookbook! ChemClubs are not the only ones using the “ChemClub Cookbook“. Many other schools are starting to learn about this great book and use it in their classrooms, including a university who added it is a required book for one of their classes! 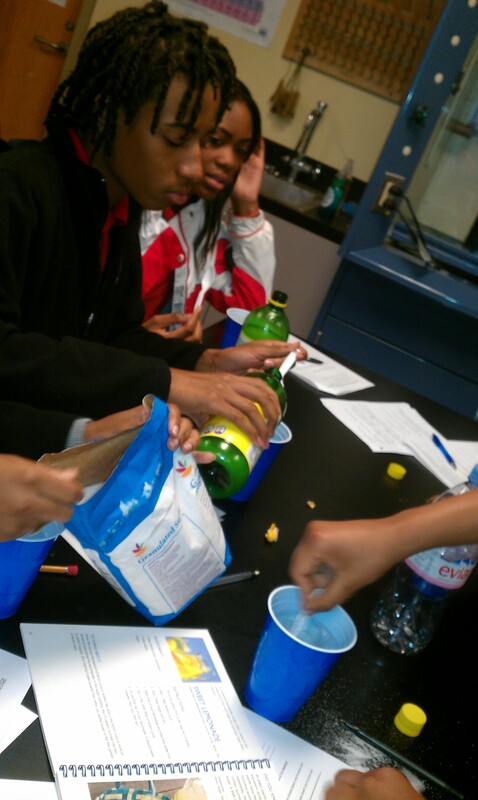 Best part of the lab – Tasting the lemonade! Have you ever wondered where the practice of giving chocolates on Valentine’s Day originated? The custom dates back to 1680’s England with the Cadbury brothers who had previously invented the first chocolate candies. These two pioneering chocolatiers secured their place in Valentine’s Day lore with the inspired marketing idea of offering their signature chocolate assortments in decorative heart-shaped boxes to mark the holiday. So began an enduring tradition that blissfully continues on to this day. Chocolate is literally a blissful treat! The ChemClub Cookbook is packed with delicious recipes, that were shared by ChemClubs last year, and short chemistry facts relating to each recipe. 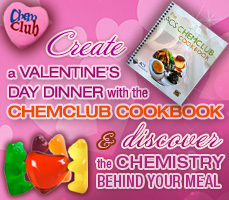 The ChemClub Cookbook makes the perfect gift for any occasion, all year round. 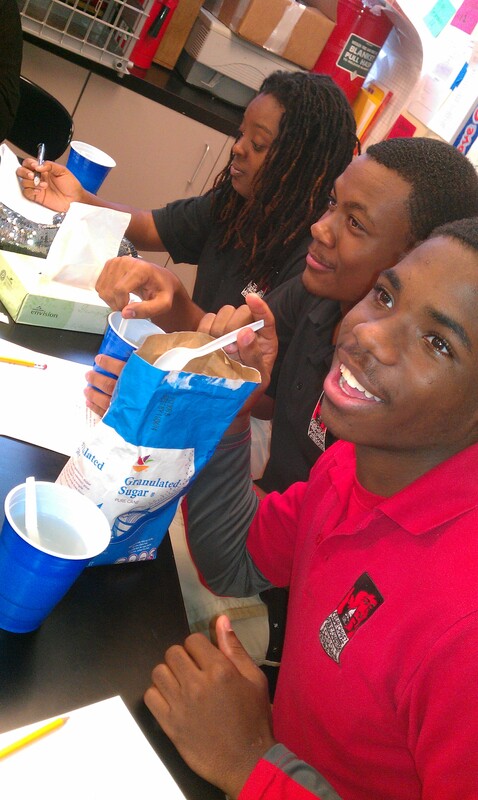 The revenues generated from sales benefit the ChemClub program. Clubs can get the book at the discounted price – just send an email to hscheclubs@acs.org for the promo code. 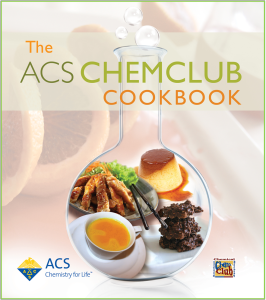 We are proud to announce the arrival of The ACS ChemClub Cookbook. 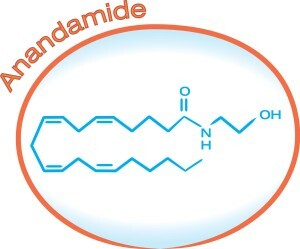 The cookbook will be available on the ACS Store (www.store.acs.org), and chartered ChemClubs may purchase the cookbook at $8/per copy by using a promo code. Please contact: hschemclubs@acs.org, for the code. Thank you to all of you who voted for your favorite cover design on Facebook. Congratulations to Toombs County High school for creating the winning design. See the original design below, and the final product above.